Can Libra men and Scorpio women relationships be compatible mentally, emotionally and sexually? As soulmates, the Libra man and Scorpio woman make a bad couple will never be compatible in love. The Libra Man will have a hard time getting along and understanding the mysterious ways of the Scorpio Woman. She is a passionate creature who is governed by constant, moving change. The Scorpio female can have a different personality each day and the Libra male might not able to handle this instability. The Libra Man will most likely be attracted to the dramatic and enthusiastic side of the Scorpio Woman. She enjoys starting new tasks even though she might have difficulty finishing them from time to time. In a Libra man Scorpio woman relationship she can offer the Libran a world of passion because she is particularly good at love-making. The only main problem is that the Libra Man looks for harmony and peace while the Scorpio Woman is a constantly moving river. Deep down inside the Scorpio Woman’s shell is a storage of loving emotions she is keeping safe till she meets the right person. The reason she is so possessive is because she wants to be feel loved and appreciated by her life partner. The Libra and Scorpio are opposites in all aspects of love compatibility in their relationship. In bed the Libra Scorpio couple can do wonders. Even while the Libra man is dating the Scorpio woman, he will be only attracted towards her sexuality. 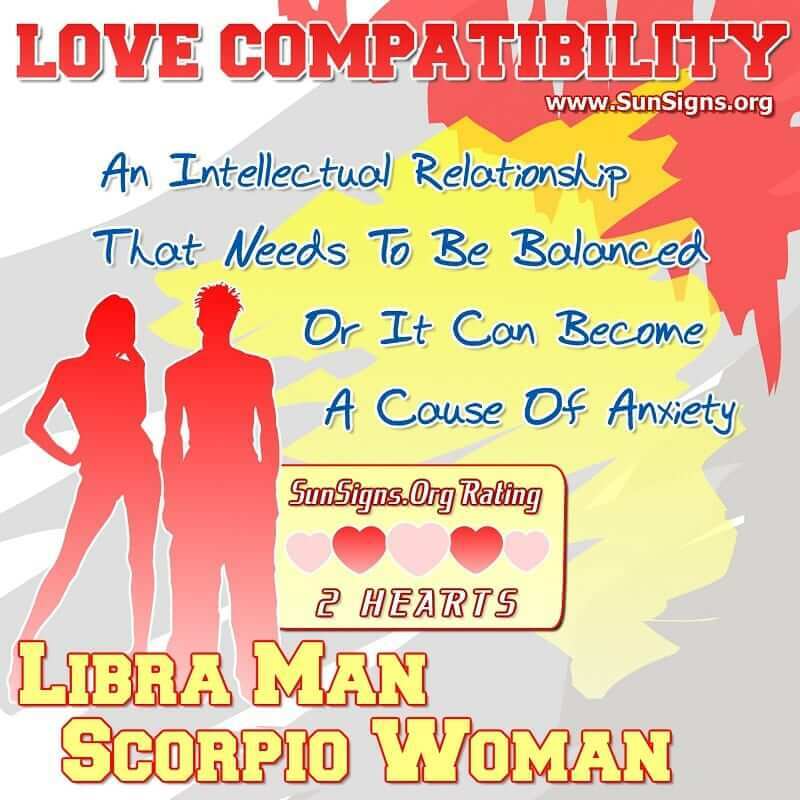 Libra Man Scorpio Woman Love Compatibility. An Intellectual Relationship That Needs To Be Rightly Balanced Or It Can Become A Cause Of Anxiety. The Scorpio Woman can sometimes be considered as a giant ball of rotating emotions. She is considered very mysterious and often attracts those who are intellectual, who want to understand her deeper side. Most people have a hard time cracking the code of the Scorpion and the Libra Man won’t be the first one to do it. The Scorpio female is very obsessive and can be jealous of the Libra guy. He has a flirtatious personality and enjoys spending time outside the house with friends. She on the other hand likes to tend house and doesn’t really care for hanging out with friends. The Scorpio lady is very possessive and will be upset with her Libra mate who is constantly away from home. Granted it is hard to keep a creature of air pinned down in one location for too long before he starts to try something new. The Libra Man needs harmony and balance in his life even though he doesn’t spend much time at home and has a bad habit of being horrible at personal finances. He will have a hard time getting along with her who is always looking for change and more than often will wake up with a new personality. The Scorpio Woman is more than likely to bring disarray to the Libra Man’s life instead of the balance he longs for. He likes to be the one that dominates in the relationship and she who is very possessive will not be willing to give him control any time soon. Scorpio Women are renowned for their performance in the bedroom. It is the Libran who will probably be exhausted by her methods and won’t be able to match her passion or persistence. He isn’t keen on love-making as much as her. The Libra man and Scorpio woman will ultimately breakup as she will probably be bored before she can decide if the relationship is worth it to her any more. Libra is an air sign that is cardinal and Scorpio is a water sign that is fixed by nature. The Libra man Scorpio woman compatibility gets a TWO Hearts love rating. When she has control over the Libra and Scorpio marriage relationship, she will feel safe and secure in the environment she has created for herself. But she will have a hard time dealing with the Libra Man who would rather be hanging out with friends then spending time with her at home. She is more likely to be jealous most of the time and it’s when the rage of the Scorpio Woman is released on the Libra man that he will make the decision to walk away from the Libra man and Scorpio woman friendship.